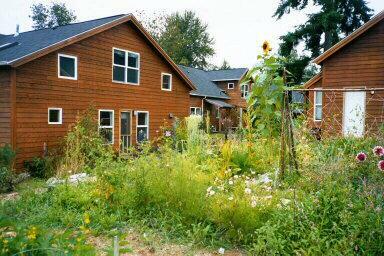 Puget Ridge cohousing in an urban cohousing community with 23 households on 2.4 acres in West Seattle. Our units are cedar-sided duplexes and triplexes that face one another. The front porches open onto courtyards and common areas, making it easy to visit neighbors, watch children, and share our lives. Our 4000-square-foot common house has a kitchen, living room, playroom, guest room, shop, laundry, and a wonderful outdoor patio. There is an optional meals program, with about 2 meals per weekthere.